I was recently asked to speak in front of a large audience of real estate investors. A good part of my presentation was centered on what investors need to do to attract buyer and seller leads; or as I call it: marketing. Marketing is a topic that’s close to my heart as it’s an area that’s of crucial importance to investors, yet it continues to remain as something that many are happy to “just get by” in. Anyway, as I'm talking, many in the the audience are looking increasingly disconnected. A few hands started going up in the room so I took the opportunity to see what the people in front of me were thinking. Here I am, in front of hundreds of people, sharing some of the lessons I’ve learned about marketing in the real estate investing industry, when it’s clear that a good percentage of the attendees don't have a clue about what I'm talking about. It’s easy to forget that investors rarely get into this business equipped with years of sales, marketing, project management, and accounting experience to back them up. With that in mind, I put together a cheat sheet of the common marketing terms that real estate investors should at least be aware of. 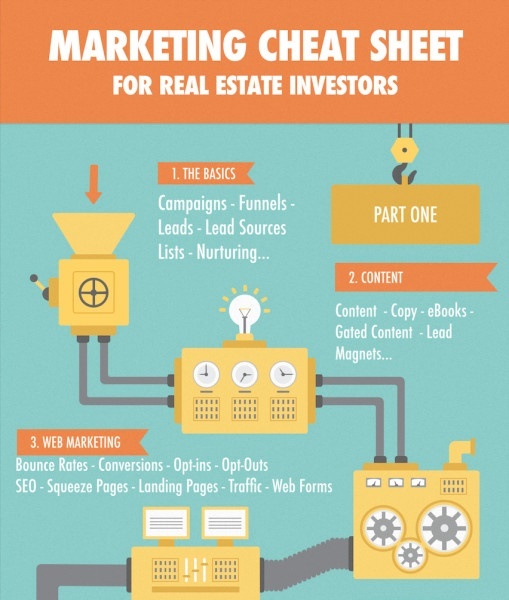 Marketing is a broad topic so this will be the first in a series of cheat sheet posts on the subject. In this post we’ll focus on some of the basic terms you might run into as well as those relating to web marketing and content. Campaign or “marketing campaign” are all the activities you do to attract a certain group of buyers to a certain product or service. While large corporations run many campaigns (Target runs campaigns for the holidays, the seasons, back-to-school, Valentine's day, etc…) most investors run one, or maybe two. At one point there was a product or service you didn’t know about. Maybe you had a need for it, maybe you didn’t. At some point you became aware of this product or service (perhaps through advertising) and eventually decided to buy it. Once you made that purchase, it’s likely that the company that sold it to you tried to sell you other things too. Well the funnel is the process of taking someone who knows nothing about a product to becoming a customer. The funnel consists of a pre-configured set of sales and marketing activities designed to created sales. A lead is an individual who may be interested in buying your product or service. Leads could be those people who complete the opt in form on your website. Leads might also come in the form of a list; a list of people who have a profile that makes them a potential customer for your product or service. The better your marketing, the better leads you will acquire. A lead source is where you get leads from. Your website could be a lead source. Direct Mail, bandit signs, squeeze pages, billboards, referrals, and advertising are all examples of lead sources. The key to lead sources is figuring out which ones actually work for you. The list is the marketing professional’s most prized possession. It’s the list of people who have indicated that they want to hear from you. The bigger the list, the more people you have to market to. Lists can take time to build and need to be maintained. Sure you want to the biggest list possible, but a list full of people who are no longer interested in your business can quickly become counter productive. You might not be ready to buy something right now, but you could be in the future… nurturing is the process of communicating with potential buyers even if they aren’t ready to buy yet. The idea is that when that buyer does decide to take action, you are at the top of their list. If you are are getting emails from businesses that are telling you what they are up to rather than trying to out and out sell you, they have you in their nurturing process. Whether through email, letters, or the very occasional phone call, nurturing potential buyers and sellers can be a very smart tactic for investors. Leads can be qualified by meeting with someone face-to-face, talking with them over the phone, or communicating via email. Qualifying a lead doesn’t guarantee that the lead will result in a deal, but it does get you one step closer. The biggest mistake investors make is spending time, or money, on a lead without qualifying it first. Content is consumable [and mostly] digital material. Text, images, video, music, and downloadable files are common examples of content. When you are watching a movie on Netflix, you are consuming content. The article you are reading right now is content. Good content keeps people engaged and coming back for more. Bad content guarantees people never return. As an investor you want to do everything you can to deliver great content to people whether that’s your website, a squeeze page, an email, or even a phone call. If you are paying more attention to this than your competitors, you’ll be ahead of the game. Marketing teams and other professional writers talk about writing or developing “copy.” The rest of the world talks about writing words. Copy is just text that’s going to be used in a marketing campaign or perhaps a news, blog, or magazine article. How do you like this copy so far? eBooks are documents, reports, brochures, guides, and other pieces of written material that are frequently offered for download as a PDF. “Download our PDF on finding motivated buyers while you sleep” is an example of an eBook you might be invited to download. Gated content is just the same as any other content, except that you have to fill out a form to get it. That eBook that we talked about earlier? The one that required you to complete the form in order to get it? That’s an example of gated content. Gated content is used by marketing people to attract leads. One difference between content and gated content is that gated content has to provide enough value to potential leads in order for them to consider completing that form. That eBook better be good! A lead magnet is designed to attract leads. Our friend, the eBook, is often used as a lead magnet. A lead magnet will appeal to a very specific group of people and will compel them to complete your web form in order to get access to it. A good lead magnet not only attracts a good deal of leads, it also gives the lead something of value. Offer someone a low value lead magnet and they might give you their contact information, but they won’t be interested in talking to you. This is a statistic for web pages. How many times have you clicked on a link, gone to a website, and then immediately hit the back button when you discovered that it wasn’t the site you were looking for? Every time you do that, it’s called a “bounce.” Bounce Rate is the percentage of people who click onto a site and then right off it again. A low bounce rate on your website is good while a high one is bad. As for what can be considered a high or low bounce rate? Anything under 40% could be considered low while anything over 70% is generally considered to be a very bad thing. You go to a website that offers you something but, in order to get it, you have to complete the form on the page. “Download your free thing now!” Every time someone fills out that form, it's a conversion. Conversion is the process of turning an anonymous web visitor into a known person with contact details (even if it's only the email address). Marketing people love to talk about conversion rates - the percentage of people who fill out that form versus the total number of people who visited the page. Unlike bounce rates, high conversion rates are a wonderful thing. Low conversion means that people are not excited about what they get in return for filling out your form. That act of filling out a web form and hitting submit is also known as opting in. You will hear marketing people talking about how many opt-ins they got from a certain email, squeeze page, or campaign. Opt-ins are valuable because an opt-in is essentially a lead or, at the very least, someone who wants to hear from you. Parting can be such sweet sorrow… An opt-out is someone who has communicated to you that they don’t want to hear from you again. You might know it better as an unsubscribe. If you are sending out marketing emails, you should be paying as much attention to opt-outs as opt-ins. Too many opt-outs mean you are emailing your list too often or aren’t telling them about anything they are interested in. As the name suggests, Search Engine Optimization is the practice of making your website as “findable” as possible when people search online. For most of the world, “Search Engine” means Google. SEO and paid search (Google AdWords) are not the same thing. Ads are displayed at the very top of the page as well as down the right hand side. They also have a yellow icon saying “Ad.” SEO determines where your site appears in the body of the results. You can tell which large companies spend the most on SEO and ads as they appear at the top of both sections! For SEO, Google has a its own set of rules when it comes to deciding where your website will show up on a given search. Google’s rules are both complex and changeable. Ultimately, Google wants to give priority to websites that deliver relevant, valuable content to visitors. SEO is important but not something to be tackled unless you have experience with it. There are no tricks or hacks with SEO anymore. Steer clear of any advice that offers “shortcuts” - these tactics may have worked in the past but today they will do your site more damage than good. Quality content is the key to SEO - if you aren’t in a position to create that content yourself, look for tools or services that can help. Your website is your main presence on the internet. It tells the world who you are, what you do, and why people should do business with you. While your website may attract some leads, it’s not a dedicated lead generation machine. For that you need a squeeze page, otherwise known as a landing page. Investors are consistently seeing far more leads coming in from squeeze pages than their core website. If you are not using a squeeze page today, you could be missing out on quality leads. Traffic is how many people visit your site during a given period of time. While more traffic is better than less traffic, the real goal should always be more quality traffic. That means lower bounce rates with visitors spending time on your site, reading about you, watching your videos, and opting in via a web form. Few of us go through the day without filling out at least one form. When you sign in to Gmail, Yahoo mail, Hotmail or any web-based email with your username and password, you are filling out a form. That “Sign up for our newsletter” option you see on this page - that’s a form (go on, fill it out!). Web forms are used everywhere and remain the most common way to capture information online. Everybody hates forms. If you want someone to complete one, you need to give them a good reason. The more you ask, the less you get. The more information someone has to enter into the form - the less likely they are to complete it. If you are not sure where to put a form on a web page - go for the top right. Use forms sparingly; remember, everybody hates them! Have a term you're not sure of and want added to the next list? Let us know by posting a comment below.